Get your sled packed and start your auger—it’s time to hit the hard water and go ice fishing. At first ice, you’ll find the fish relaxed and concentrated on prime spots. They’ll be eager to bite as they haven’t been hassled for several months and they’ve regrouped. If you don’t have a sonar unit, contour maps of the lake bottom can help. Or, if you’re fishing a lake that you also fish in the summer, you can return to some of your favorite shoals, humps, and reefs. When in doubt, it’s best to get your lure slightly above the fish rather than below them. The position of a panfish’s eyes require him to feed up. You can vastly boost the odds of a successful hookset by replacing the bottom treble hooks on your swimbaits and jigging raps with super-sharp hooks that are a size larger than the original. Gather your gear, call up some buddies, and enjoy your time on the ice. Larry Whiteley is the host of the award winning Bass Pro Shops Outdoor World Radio. This popular show has been on the air since 1992 and is the largest internationally syndicated outdoor radio show in the world. Since 1990 Larry has also been writing and recording all Bass Pro Shops in-store overhead messages as well as messages-on-hold and attendant messages for the stores phone systems. Well over 120 million people a year hear Larry’s announcements about upcoming events, special sales, store hours, and special announcements. 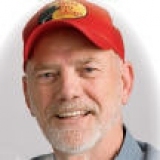 Larry also writes and records messages that talk about Bass Pro Shops conservation efforts, NASCAR involvement, BPS brands, outdoor skills workshops, BPS restaurants, Big Cedar Lodge, Tracker Marine, WOW Museum, and more.